White Zombie is one of the first “Talkie” horror movies and possibly the first to explore the zombie theme that would become a staple in the genre. With Bela Lugosi as the main character, made shortly after his blockbuster Dracula, it brought moviegoers to the theaters in 1932. 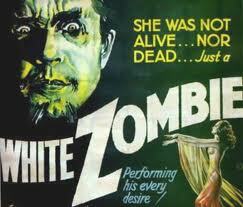 White Zombie was a relatively low budget movie at the time and used many of the sets used in Dracula and Frankenstein on the Universal Studios lots. Plot: A young man turns to a witch doctor to lure the woman he loves away from her fiance, but instead turns her into a zombie slave.